I am often asked, should children learn Krav Maga, and if so at what age? The answer is it depends. It depends on the teacher, the student, the culture and the material being taught. I have learned through many years of teaching that each age has its skill set. Try and teach a complex Brazilian Jujitsu move to a five year old and you will end up very frustrated. Try and teach a flying Taekwondo jump kick to a 65 year old and you may end up in court. Every age has its strengths and weaknesses. Thus there are two questions that need to be addressed: What techniques can a child handle physically and what concepts of self defense can a child handle mentally and emotionally. But first there is the question: Why should a child learn Krav Maga? The answer to the first question is a matter of opinion. I believe that we must face reality. We must realize that violence is part of the world today, has been forever and will most likely continue into the lives of our great grandchildren. Thus the sooner a child is prepared to deal with this reality - the better. Any skill that begins in childhood has a better chance of becoming part of a person's essence and being. 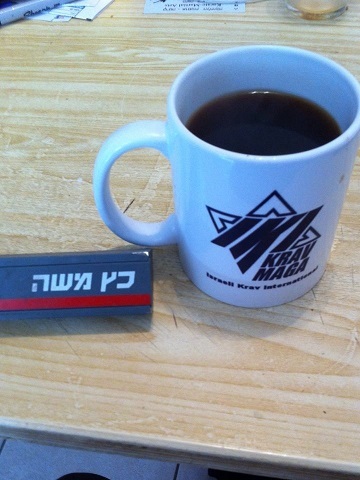 Simply put, yes, I believe everyone must learn Krav Maga. There was a time when reading and math were not considered essential for the general public. There are still some places where certain people are considered not worthy of an education. The idea of universal education is actually relatively new in the world, although for the Jewish people it has been the norm for over 3,000 years. I believe the time is right for all children to begin Krav Maga training and be black belts by the time they graduate high school. Having established that everyone must learn Krav Maga the question is how soon, at what age to begin? Physical activity begins early in life but personally I would wait until a child is 7 years old before beginning formal training. I have found that younger than that age it is very difficult to maintain control of a class. (at least in Western society) and very difficult to teach anything that resembles martial arts. At age 7 the child is able to learn the basic skills. Physical aspects: Although our style of Krav Maga is based on gross motor moves with as little precision/fine motor skills as possible, with children we must emphasize this even more - Thus only the most basic gross motor moves should be taught. Anything else is a waste of time. I incorporate some basic karate kicks, some boxing strikes, some judo moves and break-falls and rolls in particular. I like to keep in fun and simple. At this early stage I include only the most basic gun and defense situations. I find it most important to develop confidence in a fun environment. Keep the child happy and he will keep training and progressing. Give him the opportunity to succeed and he will keep training at his best level. Emotional element: This is largely cultural. In Israel every child is familiar with war and terrorism so training kid with guns and knives is not a problem at all. In other societies, in particular those who crazy modern ideas about boys not being allowed to "play" with guns, there could be issues. Some people mistakenly believe that training with weapons will lead to violence. In actuality the opposite is true. As long as a child is raised correctly, in a healthy and normal environment, there is no reason he or she should not be exposed to replica training weapons at a young age. As the child grows older more complex techniques can be taught. This will be layers added to a solid foundation based on confidence and success early in life. It is important to add elements of fun and games into the training. What begins as a fun game grows into a lifetime pursuit of self defense training. Imagine a society were all adults, men and women, were trained warriors! What would the crime rate look like? The Teacher - One who teaches children must be one with great patience. Children are a joy but also a challenge, it is not for everyone. I began Judo training at age 6 and quit Judo training at age 6. Bad teacher = poor results.